Dental filling is a convenient method we use to restore a tooth that has been damaged by decay. By using teeth fillings, we are able to repair a tooth that has lost its normal shape and cover any cavities left in your tooth. During this procedure, we completely remove the decayed part of your tooth, clean the affected cavity left behind and then fill it using the different types of dental fillers we have available. By inserting fillings we are able to seal off any spaces or cavities in the tooth that if left open, would allow entry of bacteria in the cavity resulting in further decay. In some severe cases, the decay can lead to destruction of the entire tooth. We use different types of materials as fillers; the filling material used depends on the extent of damage or your choice of filler which usually depends on your budget. It is worth noting that all the different fillers we use vary in a number of ways, no particular type of filler is best. Some of our patients exhibit allergies to certain materials, while others may not be appropriate depending on the kind of damage we are dealing with. These are made in a laboratory then later on cemented into your tooth cavity. It is one of the most expensive fillings available today. In addition, the procedure takes time and therefore has to be carried out over a number of visits. Some of the advantages of using gold fillings include the fact that Gold does not corrode, It is very durable and can last up to 20 years thanks to its ability to withstand the constant chewing forces in the mouth. Amalgam filling is made from a mixture of silver, tin, copper, zinc and mercury. Mercury constitutes nearly 50% of the entire mixture. It is also resistant to wear hence relatively expensive. Unfortunately, due to its dark color, this kind of filling is very visible and therefore not recommended for areas that are immediately visible such as the front teeth. Some of its advantages include its strength and ability to withstand chewing forces. The procedure is simple and only takes one visit to complete. 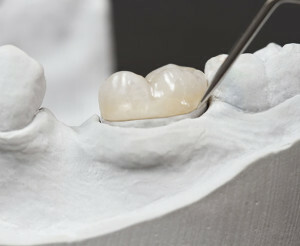 Porcelain fillings, also known as porcelain veneers, as the name suggests, are made from porcelain. Just like gold fillings, they are also made in a laboratory and later on bonded to your tooth. Porcelain is white in color and easily matches the color of your teeth making them less visible than other filling. These fillings are resistant to staining and abrasion; they are also very costly, with prices nearly matching the price of gold. Can you tell if you need a filling? No one except a professional dentist can tell when a tooth requires fillings. During your dental checkups, our dentist will examine the surface of each tooth and identify any abnormalities on them. We may also recommend an X-ray of your mouth in order to identify signs of tooth damage caused by tooth decay. We then recommend the right kind of fillings depending on the extent of the damage on the tooth.